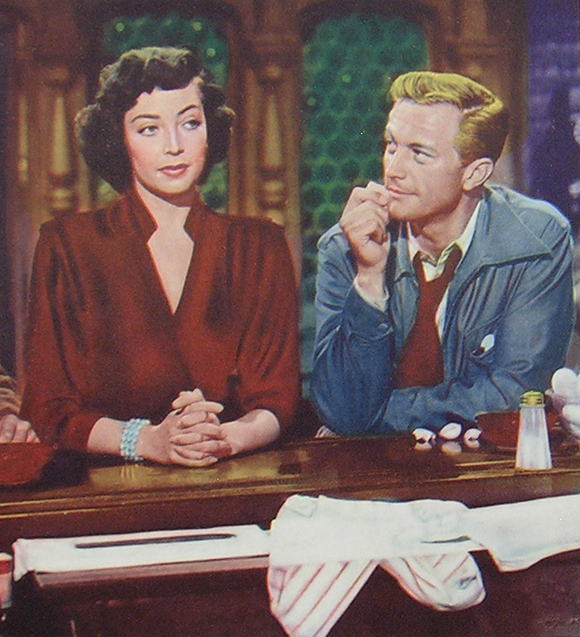 Good news: Marie Windsor is top-billed and the female lead. Less good: She's nice and the other woman (Fay Baker) is bad. Reverse their parts and we'd have a movie. Otherwise, it's a cheapie, almost poverty row-ish, reflective of RKO then-need to fill distribution channels. They released 34 features in 1950, about average for years between 1948 through 1952 (bottoms fell after that). Most were off bargain rack and looked it. 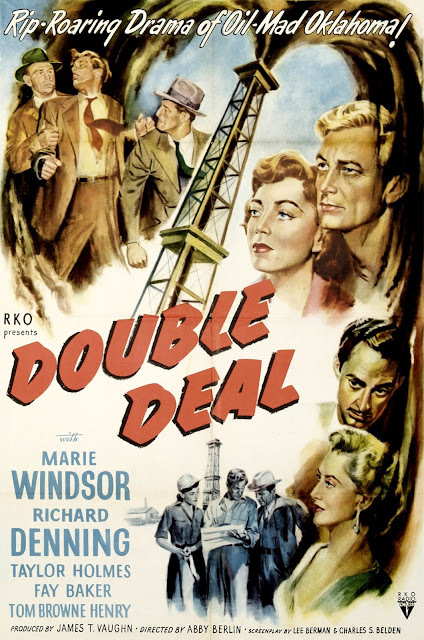 A Charles McGraw to lead and/or noirish theme could enrich outcome, but Double Deal had neither, its oil drilling a blah subject, especially with only one derrick in view. Richard Denning is "Buzz Doyle," just off a bus, then done out of his poke with loaded dice. That's a promising start, with Denning pleasant as customary, but there was seldom edge to his adventurers, nuance begin/ending with pursuit of a buck or a girl. Patronage preferred soldiers of fortune straight-forward and easily digested; it took Bob Mitchum to go successfully against the grain. Denning or a Steve Brodie were for RKO bench warming, chumps minus complexity, Double Deal strictly from hunger. Such B's were written to seven reels' measure like piece goods, but theatres needed back seaters to meet double-feature expectation. I'd like to think Howard Hughes watched Double Deal and gave Marie Windsor a nod for The Narrow Margin as result. This turns up, if at all, on TCM. No disc as yet. Is anyone waiting? I'd watch Marie Windsor read a dictionary. She's front row over Bette and Joan at my house anytime.